Wicked Broadway Musical grossed $1,471,059 and had an attendance rate of 89.7%, about 7.0% less than that of the previous week. The 25 shows on the boards grossed $19,497,282, improving around 5.95% from the previous week’s totals. 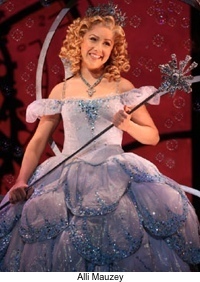 Alli Mauzey will be returning to the role of Glinda in the Broadway production of Wicked beginning September 24, 2013 at the Gershwin Theatre. Mauzey previously played both lead roles on Broadway and in the national tour of Wicked as well. Katie Rose Clark will play her final performance as Glinda on September 22 and beginning 24th Alli Mauzey will perform. Alli Mauzey will join a cast that currently includes Lindsay Mendez as Elphaba, Derek Klena as Fiyero, Carol Kane as Madame Morrible, Tom McGowan as The Wizard, Catherine Charlebois as Nessarose, John Schiappa as Dr. Dillamond and Michael Wartella as Boq. Wicked on Broadway will be celebrating its 10th Broadway anniversary on October 30, 2013. Wicked won Tony Awards for Costume Design, Scenic Design and Best Actress in a Musical (Idina Menzel). It was nominated as Best Musical. 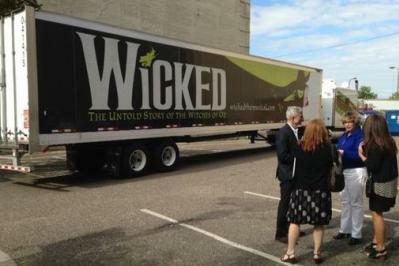 Buy Wicked Broadway Tickets Online to enjoy the musical during it’s 10th Broadway anniversary. Wicked Broadway Musical grossed $1,452,909 and had an attendance rate of 96.7%, about 4.5% more than that of the previous week. The 24 shows on the boards grossed $18,556,318, improving around 0.98% from the previous week’s totals.